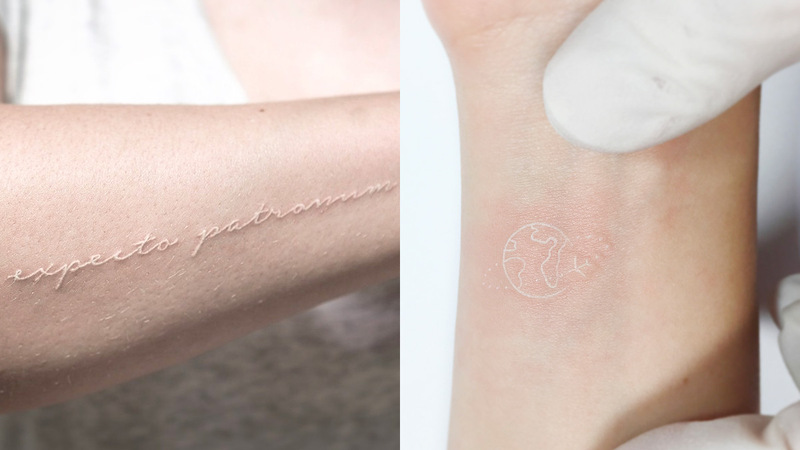 These Low-Key White Tattoos Are So Pretty! You won't have to keep it a secret! Instead of getting a ~*secret tattoo*~, why not get a white one on any part of your body? It looks amazing on all skin tones and it offers a soft, almost invisible finish. Below, some white tatts that will inspire you to go out and get one! P.S. Make sure your tattoo artist knows how to work with white ink to ensure it doesn't end up looking like a raised scar. Keep the bad vibes out with this Harry Potter spell! Who says you can't celebrate your wanderlust with a white tattoo? When it comes to tiny white tattoos, make sure to take extra care of it. Otherwise, it can end up looking dull, patchy, or faded. This floral one looks so adorable! The details in white tattoos look so ~ethereal~! Text or script is one of the best tattoos to get with white pigment.